As pictures are worth their weight in words, we’ve included a picture post to sum up our adventures in Tennessee and Arkansas as we’re now firmly ensconced at our home away from home at the Solon Dixon Center in southern Alabama. Below you’ll find pics and video of some of the locations we’ve visited and critters we’ve uncovered in our journey so far. 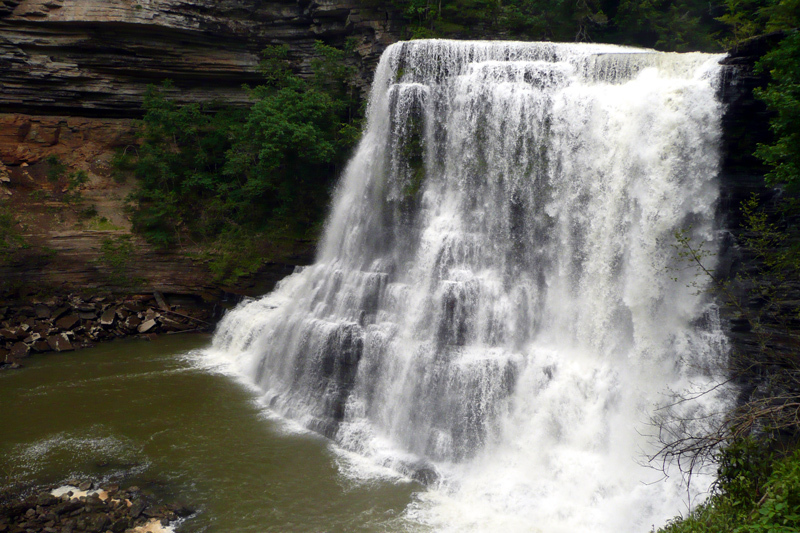 On a cloudy day at Burgess Falls State Park in Tennessee we explored the banks of the river and its waterfalls while looking for reptiles and amphibians in the nearby streams and woods. 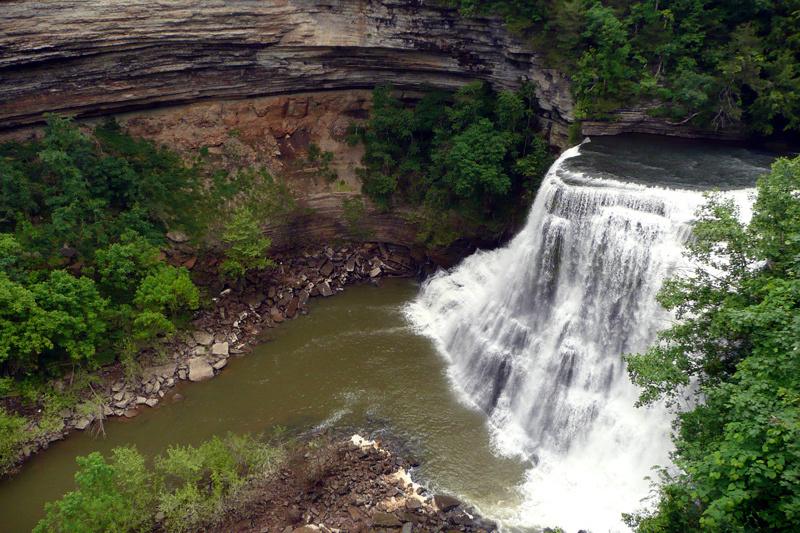 A video taken from the top of the lower falls looking down and out over the valley. While we focused on capturing fence lizards for research at our two field sites (Standing Stone and Edgar Evins State Parks), we came across many other creatures in our searches, including this black kingsnake (Lampropeltis getula nigrita) which appeared to be stalking a lizard we had just caught. 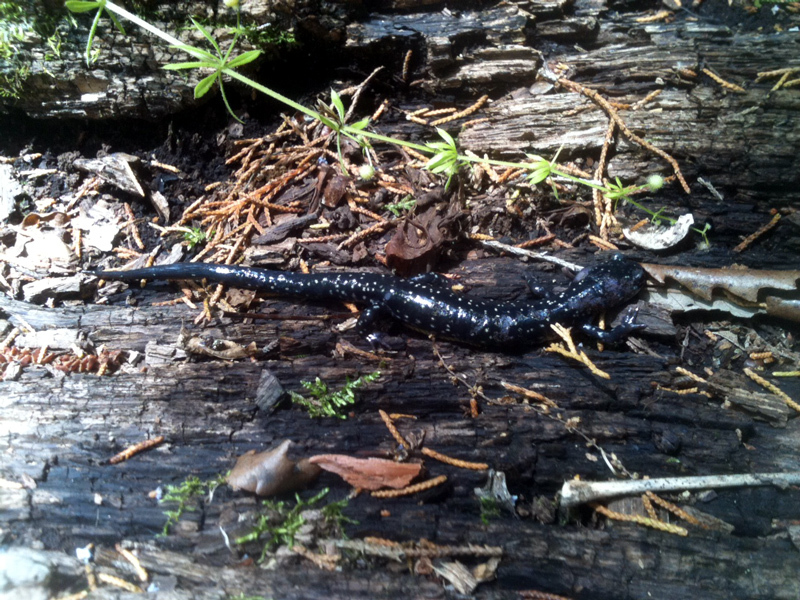 We also encountered a slimy salamander (Plethodon glutinosus), which are named for the sticky, slimy mucus that they secrete as a defense mechanism. Both Chris and Travis wound up with bits of the slime stuck on their hands for almost 2 days. Lastly, as we were exploring some rocks piers that provided perfect basking sites for fence lizards, we noticed someone else making use of the warm stone and sunshine; a young cornsnake was poking its head and a loop of its body out of a gap in the rock! 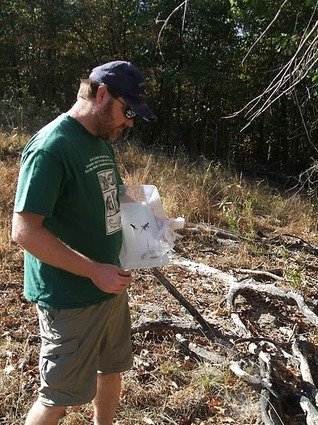 Coming soon: An update on the lizards and setting up our first round of experiments in Alabama! 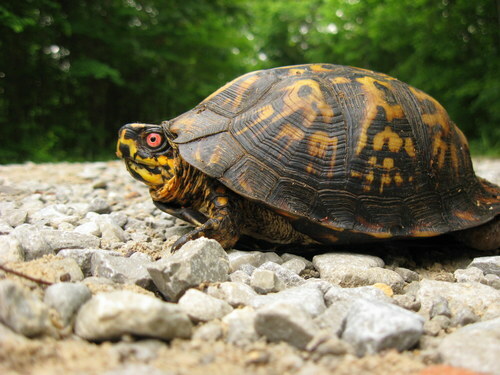 Categories: Summer 2011 Field Trip | Tags: field trip, herps, scenery | Permalink. We didn’t have much luck catching on Tuesday and Wednesday because of the weather – chilly and cloudy, a bad combination for lizards. But we more than made up for it on Thursday with a record high 51 lizards caught in one day!! Edgar Evins State Park is an amazing site for fence lizards, to say the least. We then spent the past two days collecting at Standing Stone State Park/Forest… and ended up with 31 on Friday and 12 today. 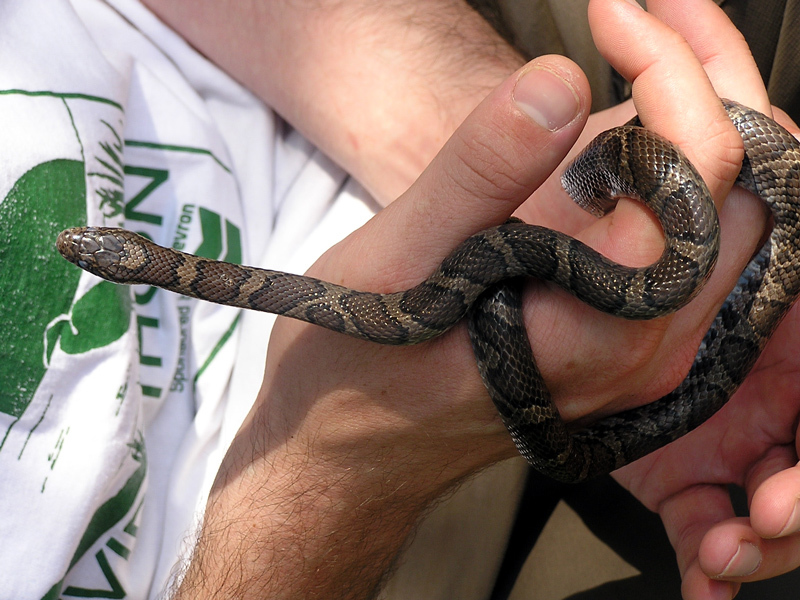 In addition to the having great lizard catching success, we’ve also seen a wide range of other herpetofauna, including box turtles, a rat snake that Travis almost stepped on, and a black racer (photos below). We are heading to Arkansas tomorrow, keeping a select few lizards with us to bring to Alabama, and returning the rest to where we found them. The 2011 field season of the Langkilde Lab began with a fabulously uneventful drive from State College, PA to Cookeville (with an “e”), TN, our base camp for exploring Edgar Evins State Park and Standing Stone State Park, our two field sites in central Tennessee. The starting lineup of the Field Research Team consists of two seasoned veterans, lab manager Nicole Freidenfelds and post-doc Dr. Travis Robbins, and one greenhorn, incoming PhD student Chris Thawley. After intense negotiations, we secured excellent accommodations at the Thunderbird Motel (rooms complete with microwave, double sinks, mini fridge, and snore machine). 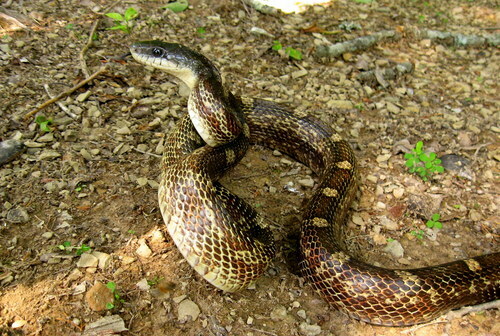 Our opening day in Tennessee was packed with several firsts, both research-related and otherwise, as we checked in at Edgar Evins State Park, a site where we had caught lizards last year and knew the ground well. Conditions were not promising, with heavy clouds and a high temperature in only the mid-50’s, but we gamely scouted throughout the park, scanning for lizard silhouettes on trees, rock walls, and picnic tables. At a promising lakeside forest, we took to the hunt on foot, working across slopes of boulders and drowned trees dappled with occasional splotches of sunlight. In spite of the rather bleak conditions, Nicole soon spotted a large female sheltering in the cleft of a boulder. After some tense moments working her lizard snare into the recess, Nicole pulled out a gravid lady lizard and popped her into a cloth sack. While we stood discussing strategy, Chris noticed another lizard clinging to the top of the same boulder and put his capture skills to their first test with a freshly-tied loop of dental floss. In spite of a stiff headwind, Chris managed to snag the lizard quickly, although his quick success was likely due to the torpid condition of the lizard itself. The remains of the day yielded little lizard-wise, as Travis managed to spot only one more juvenile, and clouds rolled in, eliminating even the scarce patches of sunlight. Returning to Cookeville, the team worked up the first two catches of the trip. 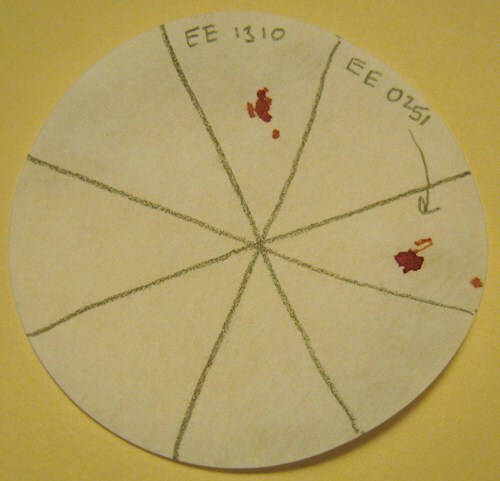 While the procedures for collecting morphological data have remained the same as in previous years, we also collected our first blood samples using filter paper. 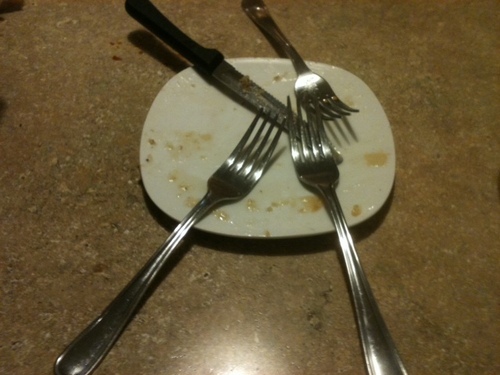 As seen in the picture below, Chris has a difficult time identifying the proper “pie slice” in which to put the samples. As the day’s work wound down, we began the quotidian debate about where to have dinner for the evening. After some quick internet searching and ground-truthing, we settled on the Gondola (Gon-“doe”-la, accent on the second syllable; source: Travis Robbins) Restaurant, a local option specializing in Greek and Italian cuisine. 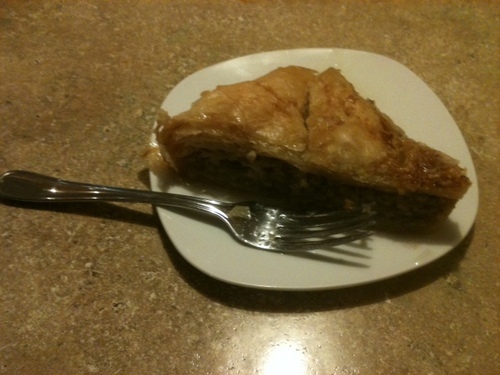 We all raved about the generous portions and tasty food, and Nicole had her first-ever taste of both spanakopita and baklava (photos below). We’ll definitely be returning for the moussaka later in the week. Full and sassy, the team returned to homebase at the Thunderbird to digest and rest up to continue the hunt in the following days. The night did bring one more first to the team, as Chris successfully slept through a full deployment of Travis’ arsenal of nuclear-powered snores in his first attempt. Categories: Summer 2011 Field Trip | Tags: by Nicole, fence lizards, field trip, hotels | Permalink. T-Minus One Week: Field Trip 1! The growing piles of equipment on lab benches are a sure sign that field season is nearly upon us. 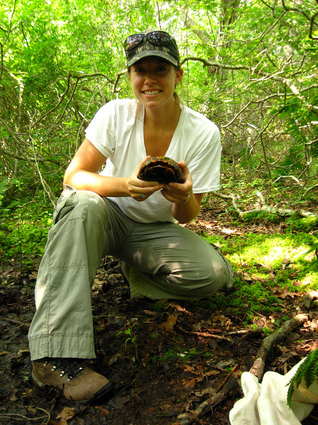 In just one week, part of our team will be heading south for the first field trip of 2011! There are several new, exciting experiments in the works for this field season that Nicole, Travis, and Chris will be preparing during this first trip. Stay tuned for their updates and more details about the great research the Langkilde Lab has in store! Categories: Summer 2011 Field Trip | Tags: by Renee, field trip | Permalink. This is going to be my last field season as a member of the Langkilde Lab, and I hope to make it a memorable one. As sad as I am to leave, I’m looking forward to helping get our new personnel and projects up-and-running. This will definitely be a busy, yet exciting summer, full of research. This is my second field season with the Langkilde Lab, and this time it’s personal. Not really. 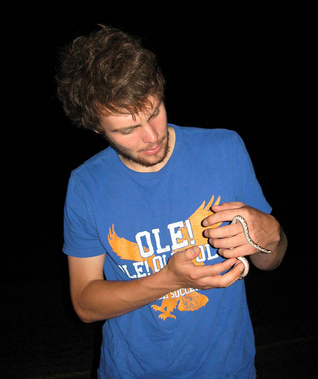 But, we have planned to begin some serious research projects this season to measure fitness of lizards based on where we find them (TN, FL, AR, AL), and if the behavioral differences we have found in the past among these populations (Langkilde_2009.pdf) can be inherited across generations. This year should prove to be exciting, busy, and fun! 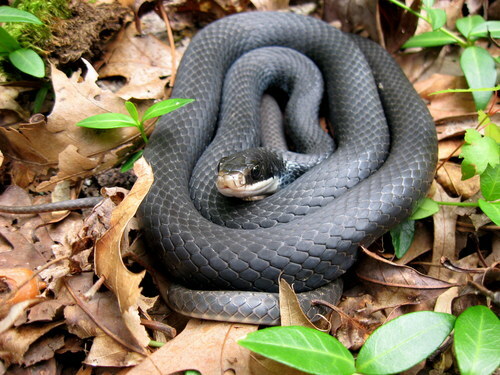 I am four months away from receiving my PhD from Auburn University, where I studied ecoimmunological topics in the cottonmouth (Agkistrodon piscivorus). This summer I will simultaneously defend my dissertation research whilst beginning post doctoral research on the fence lizard. This research will examine stress-immune interactions in fence lizards across the fire ant invasion front. This is my third field season with the lab and, again, I’m on an egg hunt. The big difference is that I’ll be using lizards from Pennsylvania instead of the south. 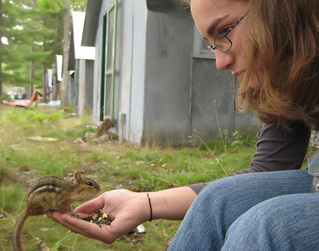 This season I’m investigating how early behavior affects growth rates and survival in the wild. 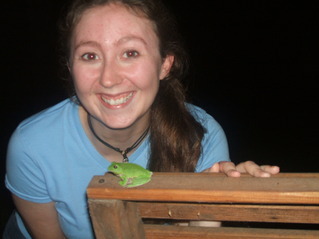 To find updates on my work with the PA lizards this summer, check out my personal blog here. I am very excited to be joining the Langkilde Lab this year and to begin my graduate experience with a trip to the south! Although I have research experience with small mammals and ants, my only experience with lizards is ogling them from afar. 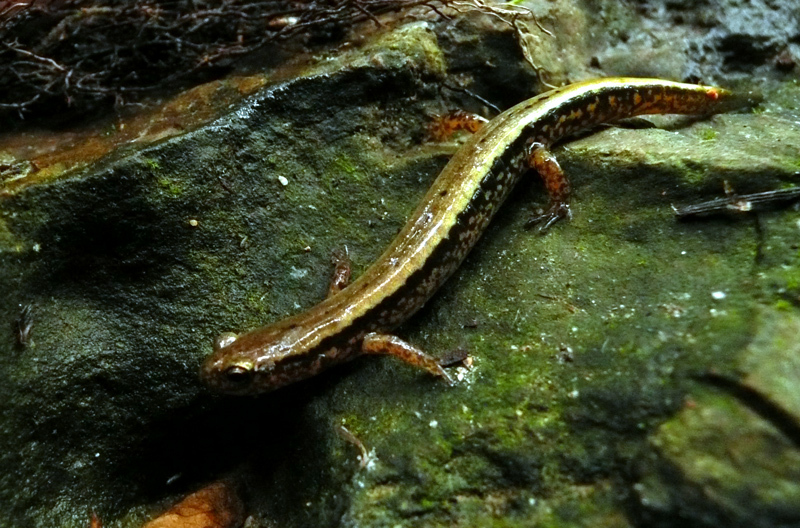 I look forward to making the acquaintance of many a lizard this summer! 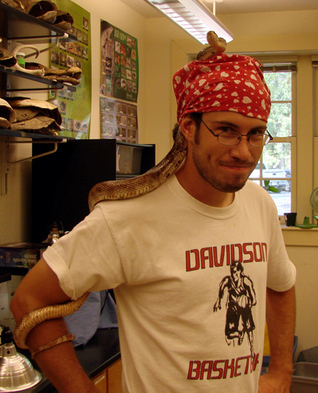 This will be my inaugural field season with the lab, and, after spending the spring in front of a computer writing up my MS, I’m excited to work on my field biologist’s tan. 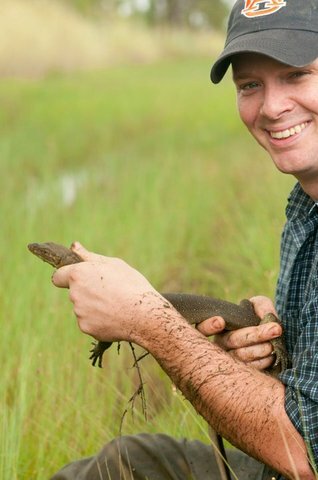 My previous experiences with lizards consist of letting them bite and dangle from my ears, so I’m looking forward to catching bushels of lizards and unraveling how their anti-predator behaviors can be inherited. Categories: Summer 2011 Field Trip | Tags: blogging, field trip | Permalink.